Today I’m excited to share my pattern for Quilt Theory’s collection for fall 2017, Into the Forest. This pattern speaks to my heart, and very much fits the vibe for my summer (it fits right in with my Summer Adventure quilt trees). For our third Quilt Theory collection, we challenged ourselves to create a color palette of 12 colors from which to pull, and all designed our quilts around the same color palette, using fabrics from a variety of manufacturers and designers. In this post you’ll not only get to see my newest pattern, Into the Forest, as well the bonus Glade Pillow pattern than accompanies my Into the Forest Quilt, but you will also have a chance to win a fat quarter bundle of Cloud 9 organic cirrus solids, so read on! 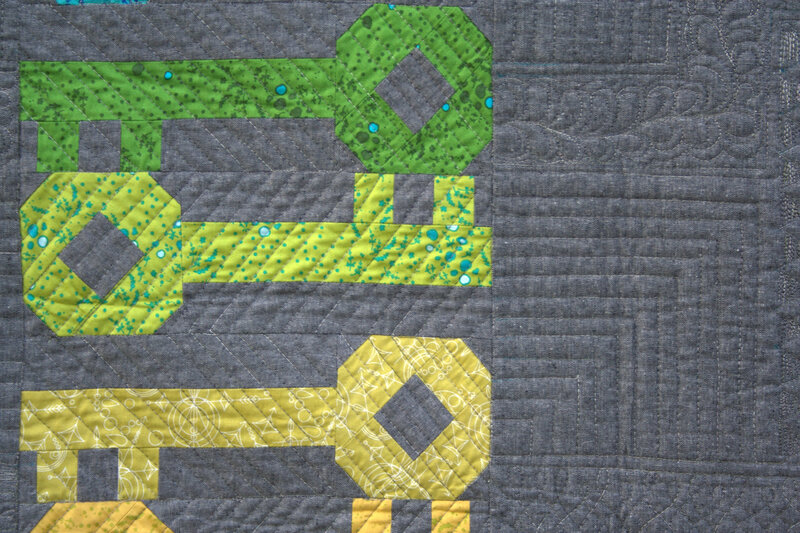 First, to introduce you to my contribution to the third Quilt Theory pattern collection! Inspired by my frequent family hikes, Into the Forest is a reminder of where you should always head–into the forest! Take a leisurely stroll with me into the depths of nature. Into the Forest plays with two sizes of the same block to create a simple graphic tree design with a crisp and clean aesthetic, like a morning stroll through a cool forest. Inspired by the majestic evergreen trees ubiquitous in Maine, this quilt uses your 5 favorite fat quarters to make a nature inspired lap quilt finishing at 52″ x 60″. 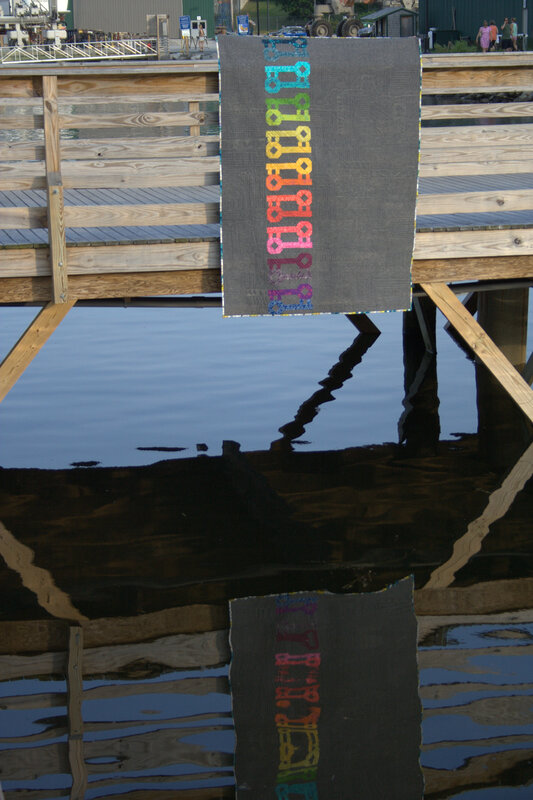 Use organic, repurposed, or naturally dyed fabrics to really become one with nature. It seemed only natural to choose Cloud 9 organic fabrics for my Into the Forest quilt, since Cloud 9 fabrics uses only 100% certified organic cotton in the manufacturing of their base cloths and eco-responsible low impact dyes for printing and dying. They work closely with mills that are committed to ethical and responsible conduct. This includes respecting the rights of all individuals, a devotion to sustained social compliance, and an accountability to the environment (from the Cloud 9 website). These practices are more important than ever, and Into the Forest seemed a perfect vehicle for this reminder. My Into the Forest quilt was partially pieced and quilted by me, and partially pieced and quilted by Sue Bishop. I’m super grateful for Sue’s willingness to step in and make progress on the quilt while I was traveling in the middle of the summer, and her work is impeccable. The quilt was quilted using straight line quilting on both a long arm and my domestic Bernina, and was both pieced and quilted using Aurifil 50wt 2024-White. In the spirit of conservation, I also created a free bonus pillow pattern that uses up most of the scraps created through the construction of Into the Forest. The link to the bonus pillow pattern is included on the pdf purchase page here, but note that you need both the pillow pattern and the original quilt pattern to create the pillow. I had a lot of fun quilting the Glade Pillow and used an assortment of Aurifil threads: 40wt: 5005-Medium turquoise, 2785-Very dark navy and 50wt: 2579-Medium orchid, 2800-Mint ice, 2021-Natural white, and of course 2600-Dove. I’ll be sharing a closer look at the Glade Pillow soon, so stay tuned! Michelle, our fearless Quilt Theory leader and company photographer got some gorgeous shots of our quilts at Urban Cashmere, too. I love these shots! All of the Quilt Theory patterns are simple enough to be printed on 4″x6″ cards or a single page downloadable pdf. At only $4 each, they are perfect for gift giving or collecting, too! Cloud 9 fabrics was generous enough to offer a fat quarter (FQ) bundle of 12 of their luscious organic cirrus solids to one of my lucky readers! Take a look at these luscious colors! Many thanks to Cloud 9 for sponsoring this giveaway, and to Yvonne from Quilting Jetgirl, who photographed these beauties for me! To enter the giveaway today, tell me your favorite conservation tip–how do you aim to help the earth daily? (If you need ideas, check this list and begin today). Leave a comment and make sure I’m able to get ahold of you if you win. For an additional entry, leave another comment telling me how you follow Night Quilter (email list, instagram, facebook, twitter, blog follower, etc.) Follow Quilt Theory (facebook, twitter, Instagram, etc.) and tell me how in a third comment for a third entry. This giveaway is open to US participants. The giveaway will be open until Monday October 23rd, at 8pm eastern time when I’ll select the winner randomly with random.org. Giveaway is open to participants 18 years or older. The giveaway is now closed! Congratulations to Abby! Tuesday 10/17 – Kitty @Night Quilter <– You are Here! Just to wrap up I’ll share a few fun outtakes from my Into the Forest photo shoot, taken with my family at Birch Point State Park in Owl’s Head, Maine before mailing the quilt off to Michelle to work her photography magic. He finally realized that I was on the other side taking photos! No photo shoot is complete without a kid cameo, though, right? I also love seeing how different the forests on the west coast look compared to the forests on the east coast. Michelle took some absolutely magical photos of Into the Forest, too. No matter where your forest may be, take Into the Forest with you! I’ll be linking up with Let’s Bee Social, TGIFF, and Crazy Mom Quilts Finish it up Friday! A while back I was contacted about the mini quilt I made for Andover Fabrics‘ booth at QuiltCon 2017, for which I used my Constant Flux pattern paired with Wild Boho-style applique and embroidery to make an Alison Glass fabric bonanza I entitled “The Bee’s Knees in Constant Flux”. A bunch of interview questions and many months later, I’m excited to have gotten a copy of the fall Modern Patchwork magazine, and I’m honored to be featured among such talent! The article, written by Meg Cox, discusses the appeal of embroidery and hand stitching to modern quilters, and features many of my favorite makers–Alison Glass, Rebecca Ringquist, Nichole Vogelsinger, and Hannah Claire Somerville, all of whom have inspired me along my path to embroidery and its involvement in modern quilting. I ordered my copy of the magazine through the Quilting Daily website, but I also have seen copies at my local big box bookstore (Books-a-Million) and Joann Fabric stores. Do you subscribe to this magazine? I’d love to hear what you thought about the interview, and about embroidery’s role in modern quilting! I’m excited to incorporate embroidery and hand quilting into more of my future makes. Now I just need to figure out how to jump back on the “finish the project” bandwagon! ha! Today I’m excited to share my pattern for Quilt Theory’s collection for spring 2017. 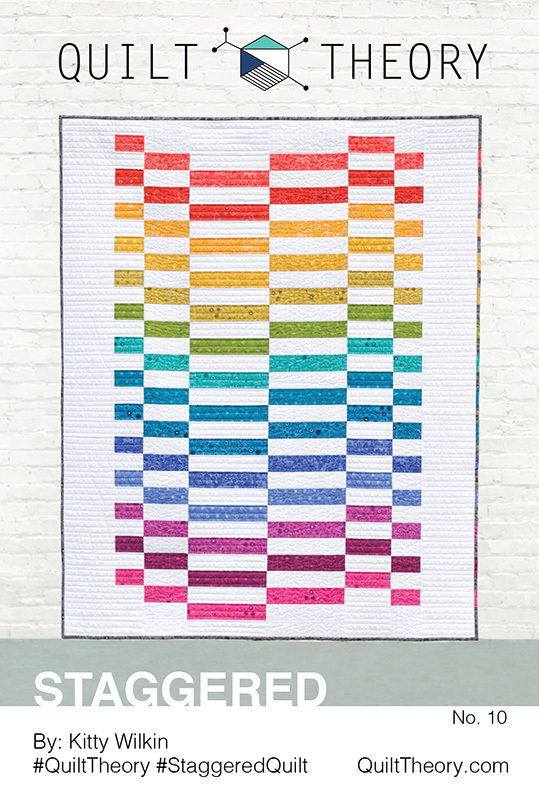 I’m really excited about this collection as a whole; there is such a great variety of easy, innovative, and fun quilt patterns, and I’m sure you’ll fall in love with all of them. For our second collection, we challenged ourselves to write patterns that utilize precut bundles of fabric. 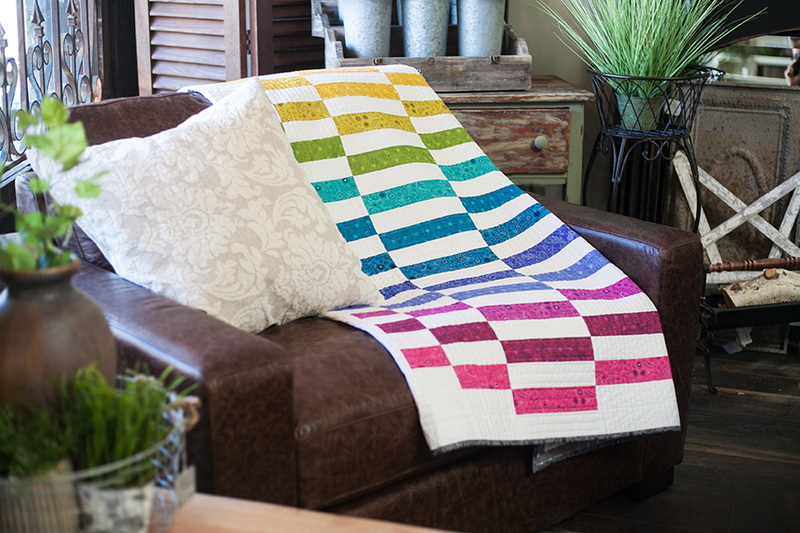 Our hope is that you find a lot of inspiration in our collection to make quilts from your favorite bundles in your stash. In this post you’ll also have a chance to win a copy of my Staggered pattern, a rainbow bundle of Alison Glass fabric, and a spool of Aurifil thread, so read on! First, to introduce you to my contribution to the second Quilt Theory pattern collection! 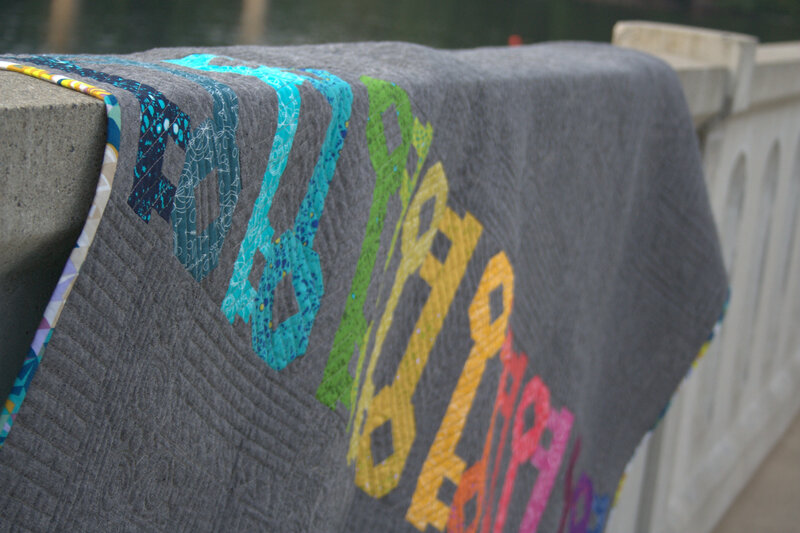 Staggered is a fun, easy, extremely versatile pattern that is a fun way to showcase your favorite fabric line. When thinking about possible patterns to create for this collection, I turned again toward nature. With the vision of rock strata, water ripples, and windblown sand swirling in my mind, Staggered was born. Designed to be jellyroll friendly, the assembly instructions make it a very quick sew, perfect for all styles and quilty needs. I used 14 of my favorite prints from the Sun Print 2017 line by Alison Glass for Andover Fabrics, with Lizzy House‘s Asterisk in white as a background. 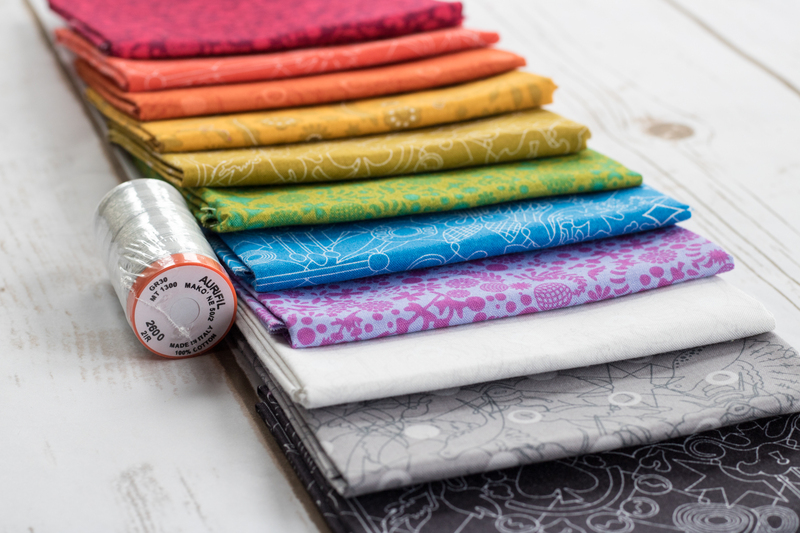 I love the vibrancy of Alison’s fabrics, and the hand of Andover fabrics is the perfect balance of soft and supple and sturdy and strong. 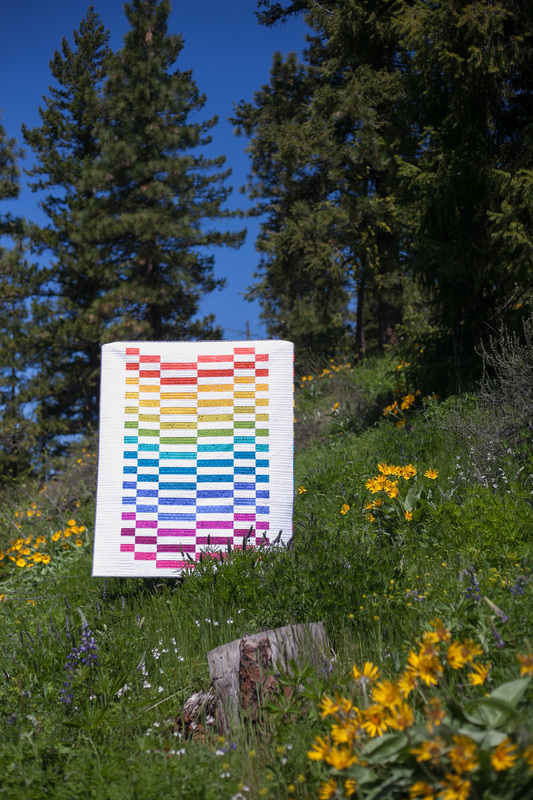 When searching for a rainbow, I always head to Alison Glass fabrics first! Many thanks to Andover Fabrics for providing the fabric for this quilt! Whether using a strip of yardage from your favorite designer, or an old stashed jelly roll of a favorite fabric line that’s been sitting in a drawer for years, this is the perfect pattern to put your favorite fabrics on show! I’m not a Liberty of London girl, typically, but for some reason I’m itching to make this quilt using Liberty fabrics and a textured solid background. I can’t wait to see what fabric combinations you use! 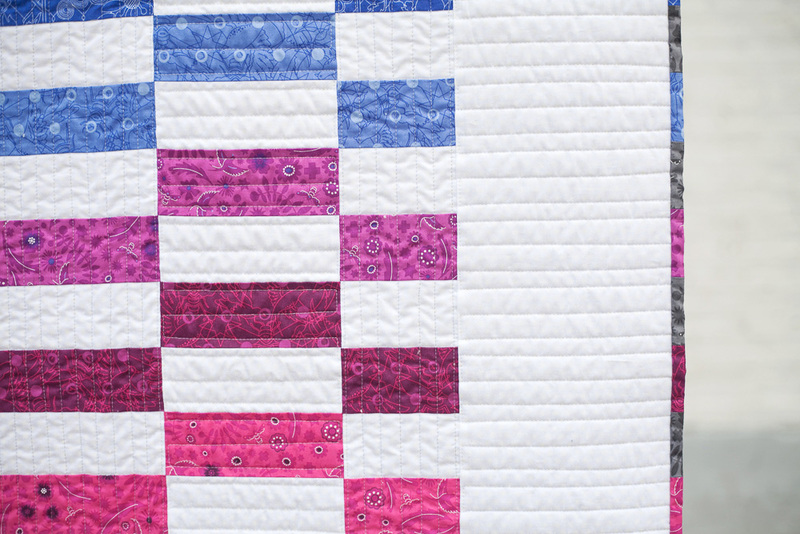 I quilted my sample with alternating vertical and horizontal straight lines, emphasizing the stagger in the pattern. I used 50wt Aurifil thread in 2021-Natural White horizontally and 2600-Dove vertically, with the walking foot on my Bernina 560. The subtle color difference in thread is nearly imperceptible, but it was a fun experiment to see if Dove truly does blend in with every color. It does! Many thanks to Aurifil for supporting Quilt Theory and providing the thread needed for our projects! Staggered also includes a link to instructions for a bonus rainbow binding, since I couldn’t help but extend that rainbow off the edge of the quilt. So much fun! All of the Quilt Theory patterns are simple enough to be printed on 4″x6″ cards or a single page downloadable pdf. At only $3 each, they are perfect for gift giving or collecting, too! Let me tell you a bit more about the designer team behind Quilt Theory. 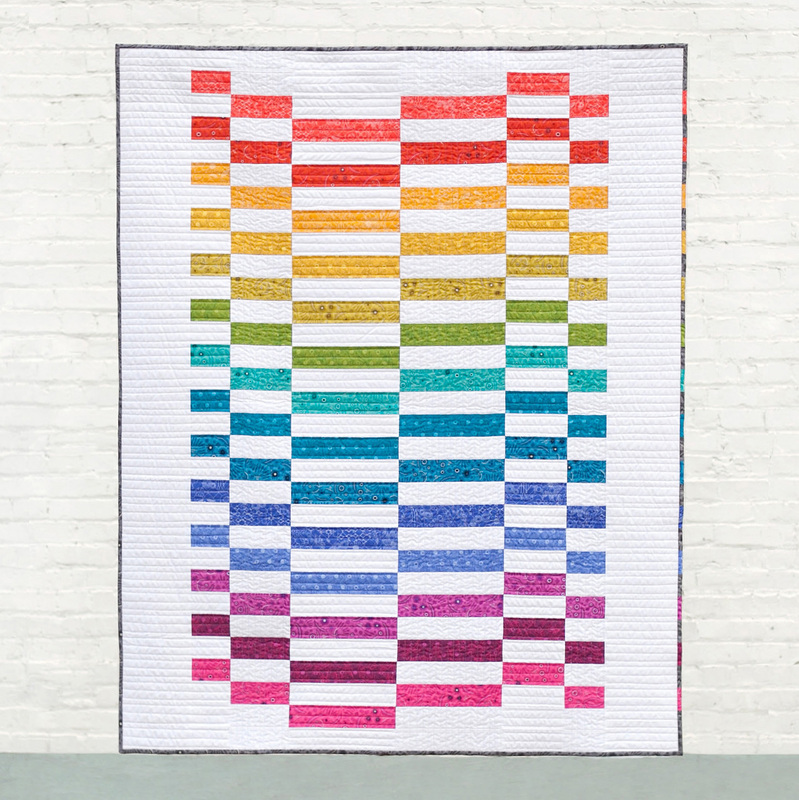 Our goal at Quilt Theory is to create simple and modern quilt patterns, and as I mentioned above, for this collection we focused on using precuts. I am so excited about this collection as a whole, since I can see that we are really melding as a group and the efforts show. We have become a strong team as we worked through writing, testing, editing, and quilting the patterns in our collection, and I’m excited to see how you take these patterns and make them your own. I think many of you are familiar with the Quilt Theory team members, but for those of you who are not, here’s a brief introduction. Quilt Theory designers have been featured in 20+ major quilting publications and international quilt exhibits. Combined, we have 47 years of quilting experience, and we are excited to share our second collection for Spring 2017. Pattern cards will be coming soon to a local quilt shop near you! 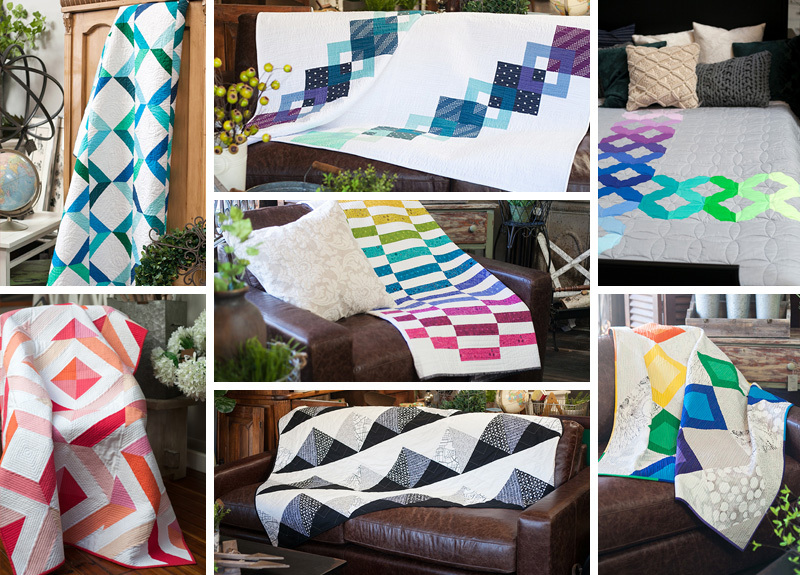 If you are a quilt shop and want to carry our patterns, set up a wholesale account here, or order through Checker Distributors, EE Schenck Company, or Erie Quilt Art for Canadian shops. To celebrate the release of Collection 2 for Quilt Theory, I am giving away a copy of my pattern, Staggered (printed or PDF, your choice!) along with a bundle of 11 Alison Glass fabric fat quarters straight from my stash and a large spool of Aurifil 50wt 2600-Dove, my panacea thread. See? I really do love you! To enter the giveaway today, tell me what fabric collection you would use to create Staggered. Leave a comment and make sure I’m able to get ahold of you if you win. For an additional entry, leave another comment telling me how you follow Night Quilter (email list, instagram, facebook, twitter, blog follower, etc.) Follow Quilt Theory (facebook, twitter, Instagram, etc.) and tell me how in a third comment for a third entry. This giveaway is open to US and international participants. The giveaway will be open until Sunday, May 21st, at 8pm eastern time when I’ll select the winner randomly with random.org. Giveaway is open to participants 18 years or older. *If you buy my pattern and then you win it, I’ll refund you or let you pick out another free Quilt Theory pattern! Giveaway is now closed! Congratulations to Mary! Saturday 5/13 – Kitty @Night Quilter <–YOU ARE HERE! Today I’m so excited to share that my magazine debut (as the covergirl, no less!) is here. My pattern Unlocked appears in this month’s edition of Make Modern magazine, and even graces the cover (can you say excited!?!). Make Modern is a digital modern quilting magazine, full of great patterns for quilts and smaller sewn items, articles, tips, and features. 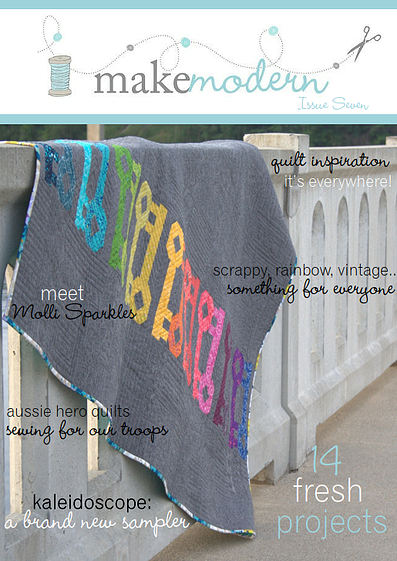 This issue (Issue 7) has a lovely meet and greet with none other than the most glittery quilter around: Molli Sparkles. 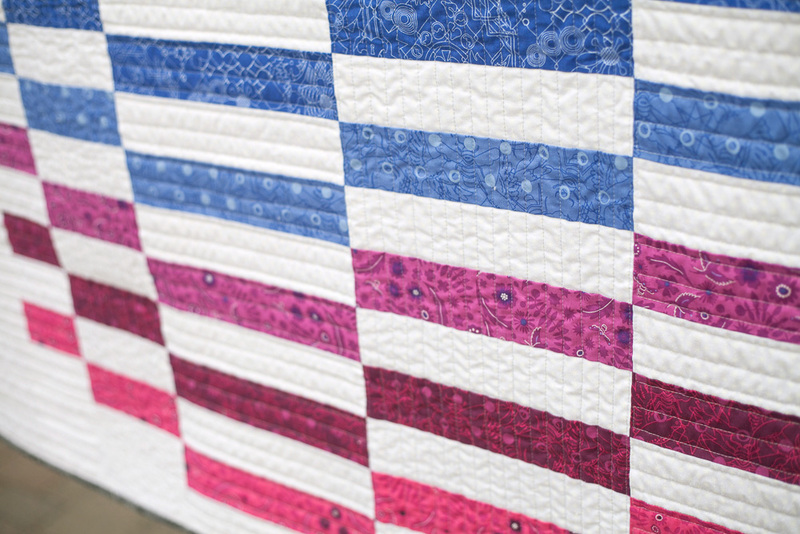 Based in Australia, Make Modern was the brainchild of three quilting friends: Jane, Lara, and Kristy. You can read about their philosophy HERE, which I definitely recommend. 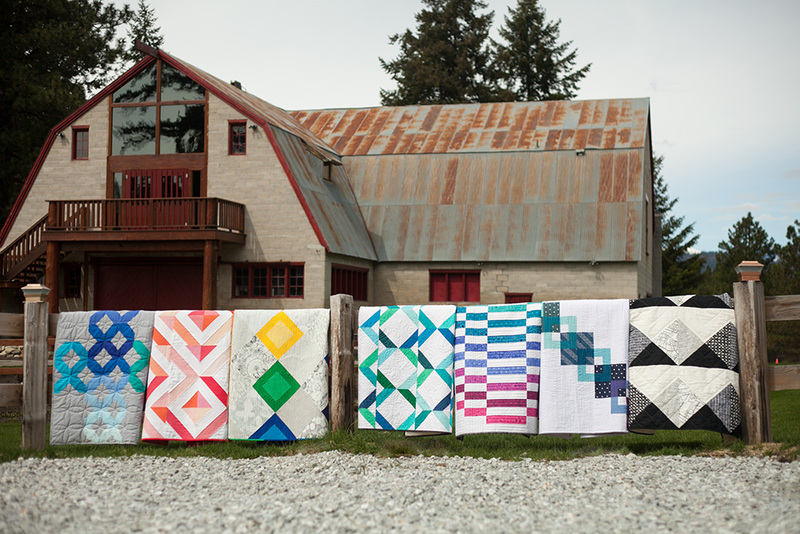 From the sustainability and accessibility of a digital magazine, to being a positive driving force in the modern quilting world, they’ve got it going on. You can purchase single issues of the magazine or can choose 3 issue (6 month) or 6 issue (yearly) digital subscriptions. I’m honored to be a part of this publication. I’ve shown you tiny peeks at my quilt Unlocked, but really nothing that gave away more than the obvious: it features the full Mercury and Grove lines from Alison Glass’s 2015 Sun Prints, on a gorgeous Robert Kaufman Essex Yarn Dyed Linen in Charcoal background. I used my go-to thread panacea Aurifil Dove #2600 for piecing. 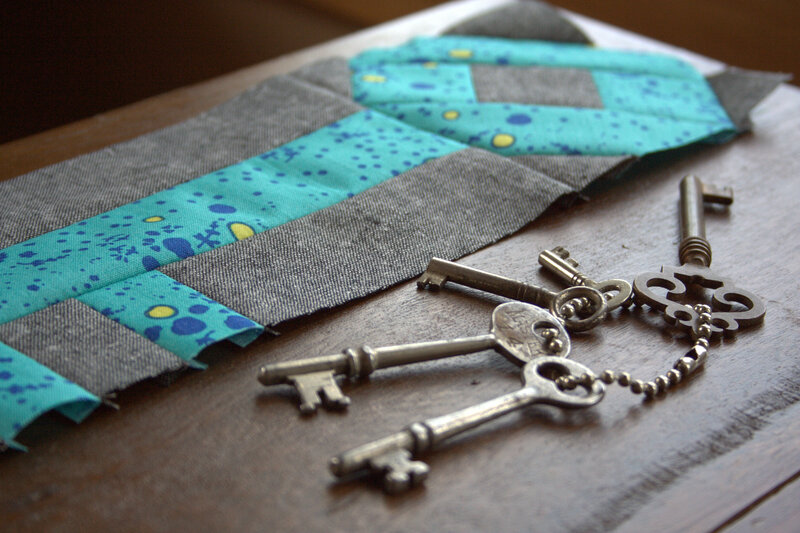 It’s very scrap-friendly, since each key only needs a fat eighth of fabric. Unlocked is also super versatile since a simple adjustment of the number of keys made and surrounding background results in any sized quilt you want. While I really wanted a castle door or giant gate in which to photograph this quilt, a trip to Ireland was not in the budget, so Belfast, Maine had to suffice. I have the world’s best quilt holding husband, who schlepped our kids and a quilt all over town at the whim of me, his crazy quilt-making photo-crazed wife. We got some great shots, though, so I’d say it was well worth it! He really should start a blog “Behind the Quilts”. 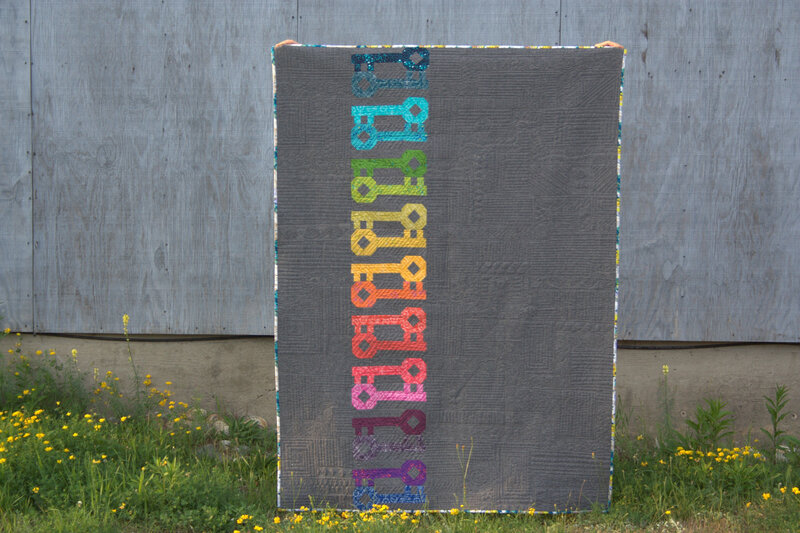 Unlocked was longarm quilted by my ever-talented friend Stephanie at Late Night Quilter and it looks amazing. She used the Cityscape Path straight line quilting style designed by Krista Withers and photos don’t even come close to doing it justice. I’m so grateful to Stephanie for quilting this, since I was able to finish the quilt top and mail it off to Stephanie right before giving birth to Finn. Then, she was able to quilt it and get it back to me a couple weeks postpartum so that I could bind it and photograph it in time for the publication deadline. Teamwork at its best! Head on over to Make Modern and grab your copy of this fabulous modern quilting publication.